"Auspuff-Endstücke, 3″, Edelstahl, 71-74 B-Body, oval flach"
New reproduction stainless steel slotted exhaust tips for 1971-74 B-body models. 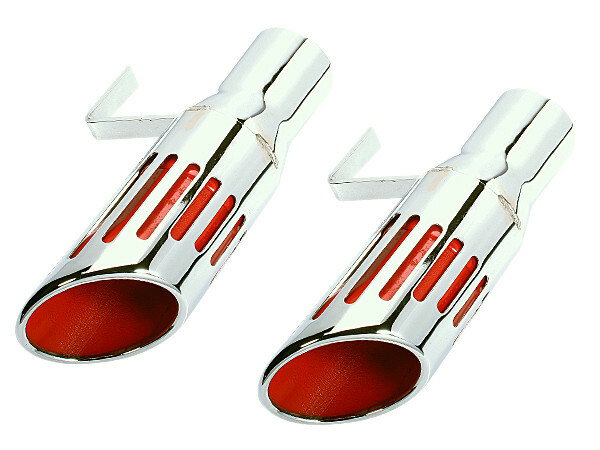 Our polished exhaust tips feature red ″ slots″ just like originals and are made of stainless steel. Also called ″ Machine-Gun″ exhaust tips, they feature correct markings and will fit just like original on exhaust systems. These exhaust tips are the long style.